Things can seem so simple through the eyes of a child. There is no grey, only black and white, right and wrong. It often makes adults, those who “know better,” simply shake their heads. But it’s also why children can surprise us and enlighten us, can accomplish things we wouldn’t have even dreamed of—like, say, improving cancer research with nothing more than a lemonade stand. By the time she was eight years old, Alexandra Scott, the founder of Alex’s Lemonade Stand, had turned that dream into a reality with little more than ambition and the inability to “know better.” And really, it shouldn’t have surprised anyone. Scott had been a fighter her entire life. Before she even celebrated her first birthday, she was diagnosed with neuroblastoma, a form of childhood cancer. The doctors told her parents that even if Scott survived she probably wouldn’t walk again. But just two weeks later, Scott was able to slightly move her leg, and by the time she turned two she was able to stand with the help of leg braces. Then they heard the news: Alex’s tumors had started to grow back. The disease she had fought so hard against refused to go away, but she never let up. When she was four, she told her mom that she wanted to start lemonade stand when she got out of the hospital to help kids suffering like her. It made it sound so plain: there were kids who needed help, and she had a way, however small, to provide it. While fighting her own battle against cancer, Alex and her parents held a yearly lemonade stand to benefit pediatric cancer research. Her first stand raised a staggering $2,000, as friends and family pitched in and word spread of this courageous girl. The project just kept growing and growing thanks to Alex’s spirit, as people all around the world were moved by her story and her determination. Alex tragically passed away in 2004, but she did so knowing that her little lemonade stand had led to $1 million toward finding a cure for cancer. Her mission lives on to this day, as the Alex’s Lemonade Stand Foundation continues to raise money and awareness. An adult may have known that raising millions from a lemonade stand was impossible, especially while battling against cancer. But Alexandra Scott didn’t know the meaning of that word. All she knew was that there were people to help, and she could do it. Sometimes things really are just black and white. 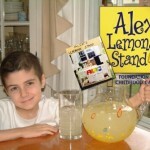 To learn more about Alex’s story, visit Alex’s Lemonade Stand Foundation.